pop-in legs and 6" caster wheels make it easy to move. this full-size event charcoal grill is ideal f for family get-togethers. 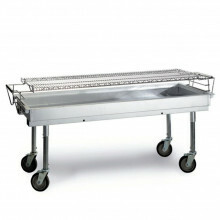 has 5' x 2' grilling surface is big enough for 125 hot dogs, 65 burgers, or 45 juicy steaks at once. needs 3 bags of charcoal to get a nice bed.